Should you get amped up about high-impedance headphones? If you've spent any amount of time researching quality headphones online, then you've probably come across a specific type called 'high-impedance headphones'. Audio savants claim that these headphones, which are defined by an impedance rating of around 25 ohms or above, offer a more dynamic and expressive level of sound quality that will add a new dimension to your music. In short, they're constructed to create less distortion and maintain an audio file's integrity better than a lower impedance pair of headphones can. Unfortunately it's not as simple as just buying a pair of high-impedance headphones and plugging them into your portable music player – you'll need to carefully consider the rest of your equipment if you want to hear a difference between the expensive, audiophile-grade equipment and your run-of-the-mill set of cans. The simple answer is that high-impedance headphones are headphones which are less sensitive (e.g. sound quieter using a phone's built-in amplifier) and require more power to drive. High-impedance headphones are less sensitive (e.g. sound quieter using a phone's built-in amplifier) and require more power to drive. This power requirement all comes down to the voice coil used in the headphone's drivers, the small speakers that sit inside the earcups that produces the sound that your ears end up hearing. High-impedance 'phones use a much thinner voice coil in their drivers which is wound with less air between the individual wires, resulting in less sound distortion and a better level of bass reproduction. So why aren't all headphones like this? The answer is partly to do with manufacturing costs, and partly to do with how portable most headphones are made to be. The thinner voice coil found in high-impedance headphones requires more precision to produce, and as a result their manufacturing costs are higher. More importantly, high-impedance headphones require more power to effectively drive, which means that portable music players running off batteries are ill-equipped to deal with their power requirements. Audio manufacturers, cognizant of the fact that Hi-Res audio hasn't caught on the same way HD Television has, generally steer clear of high-impedance headphones unless they're going for the upscale, audiophile market. So they won't work with my existing setup? High-impedance headphones plugged into your phone's headphone output will absolutely still work, but since headphone jacks are designed with regular-impedance headphones in mind you won't get the best of them in this setup. ...but you'll need to invest in a dedicated headphone amplifier. 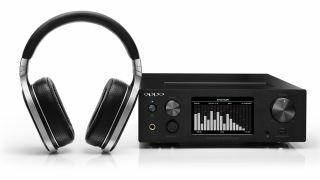 In order to get the most from them you'll need to invest in a dedicated headphone amplifier. There are many of these that exist for traditional Hi-Fi setups such as the Beyerdynamic A1 headphone amp, and increasingly manufacturers are producing compact versions that can be used with both a home and mobile setup. If you want to get really technical, most headphone amps will suit different levels of impedance better than others. To get around this problem, Audio Technica's $6000 / £4500 AT-H5050H Reference headphone amplifier, offers four different headphone jacks, each supporting a difference level of impedance. That's obviously a bit much for your first amplifier, and those of us with more modest budgets will have to settle for finding a headphone amp that suits our particular headphones. High-impedance headphones might offer the ever-tempting benefit of bigger numbers on the box, but their benefits are subtle and need proper equipment to take full advantage of. So if you're someone who feels the sound from your existing mid-range headphones could use a little more refinement, then you might want to consider going high-impedance. If you're someone who doesn't mind a lack of clarity – or willing to settle for much more subtle indicators of sound quality – then it's probably best to hold off on the high-end headphones and amps. Speaking of, check out our list of the best headphones.